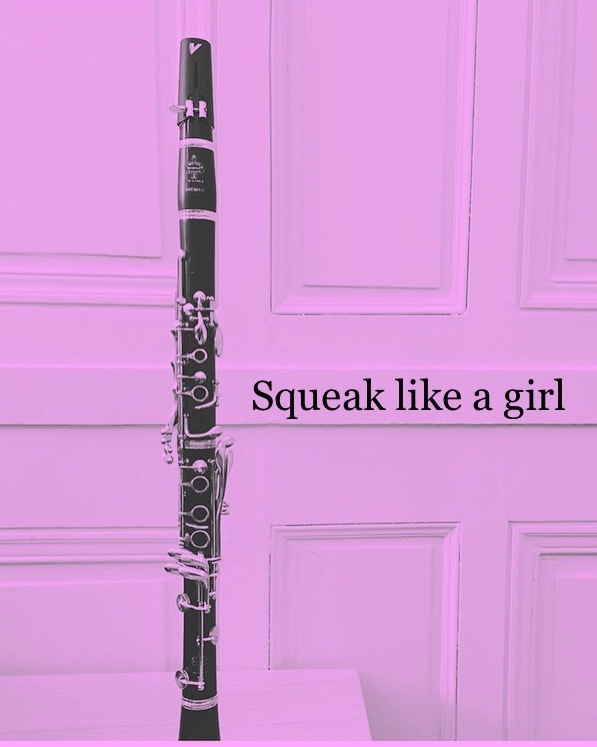 In honor of National Women’s History Month, I’d like to share some truly inspirational barrier-breaking female clarinetists past and present. To all my fellow female clarinetists out there, let’s keep breaking boundaries, supporting other women, and sharing our history through music! Schleicher Sisters – the Schleicher sisters, Cordula Metzger and Caroline Krähmer, were born to Swiss parents. Their mother played the clarinet and violin and often performed with local ensembles. Their father played bassoon, and the sisters often performed trios for bassoon and two clarinets. Had Mother Schleicher (forename and dates unknown) not raised 13 children, she might have become a famous clarinetist too! Cordula Metzger (née Schleicher, 1788-1821). Cordula Metzger was supposed to learn flute, but she secretly practiced clarinet. She was quite good and was eventually allowed to switch to clarinet. In 1808, Metzger became the world’s first female salaried principal clarinet at the Allgemeine Musikgesellschaft Zürich. She was the only woman in the ensemble of 50 men, and she often soloed with this orchestra. Caroline Krähmer (née Schleicher, 1794-c. 1873). Caroline Krähmer became known as an international soloist and toured all throughout Europe, performing works by Weber, Tausch, Mozart, and more. As you can imagine, she received a fair share of sexist reviews. After a concert in Munich, the Allgemeine Musikalische Zeitung wrote: “Our modern beauties do not want to be excluded from a share in the performing arts.” One review in Vienna reads: “The seductive playing of this modest artist once more excited the most lively interest.” Caroline was also a composer (she wrote her Clarinet Sonatine in 1825), and she was included in Sauer & Leidesdorf’s 1825 list of fifty of “the most considerable composers, whose procession is led by the Prince of Music, our genius, Beethoven.” Also in this list were Beethoven, Schubert, and other famous composers. While she was garnering international acclaim, she managed to raise her 10 children – so don’t let anyone tell you that you have to choose between a career and a family! Jeannette Scheerer (1905-unknown) When Scheerer was appointed principal clarinetist of the New Orleans Symphony Orchestra in 1941, this Iowa native became the first female principal clarinetist of a major U.S. orchestra. This boundary-busting clarinetist got her solo debut with the Cedar Falls (Iowa) concert band, but she was not allowed to join the all-male ensemble. To create performing opportunities for other women, Scheerer and fellow female conductor Antonia Brica, created the New York Women’s Symphony Orchestra. Scheerer later created the New York Women’s Chamber Orchestra. Scheerer is listed in the 1941 Who’s Who in Music. Pauline Juler (1914-2003). Juler was an English clarinetist and dedicatee of Finzi’s Five Bagatelles and his Clarinet Concerto. In a letter to Finzi, Ralph Vaughan Williams said, “I hope Pauline is going to play them.” No worries Ralph, Pauline performed the premiere! Pamela Weston (1921-2009). Where does one begin to describe the enormous impact British clarinetist and scholar Pamela Weston has had on the clarinet world? She is one of the world’s leading clarinet scholars and one of my greatest musical inspirations. Weston was a student of Frederick Thurston and studied at the Royal Academy of Music and later at the Guildhall School of Music, where she later became professor of clarinet (1951-1969). Her research on clarinet history is presented in her articles and books, most notably Clarinet Virtuosi of the Past (1971), More Clarinet Virtuosi of the Past (1977), Clarinet Virtuosi of Today (1989), and Yesterday’s Clarinettists: A Sequel (2002). Weston suffered from myalgic encephalomyelitis, and she traveled to Switzerland for assisted suicide after many years of enduring excruciating pain. Her meticulous and comprehensive research are second to none, and the bravery in her personal life is truly admirable. Thea King (1925-2007). Famed British clarinetist Dorothea “Thea” King studied at the Royal College of Music before becoming principal clarinetist of the English Chamber Orchestra from 1964 to 1999. When she was a schoolchild in Bedford, she befriended Elizabeth Thurston, daughter of Frederick Thurston, her future teacher. King received many opportunities to perform while their male colleagues were at war, such as her post as co-principal of the Sadler’s Wells Orchestra. She commissioned many works by British composers, and she championed many lesser-known works from the 18th and 19th century. Her dedication and work in the arts paid off – in 1985 she was made an Order of the British Empire (OBE) and in 2001 was made Dame – the first wind-playing dame in history. Georgina Dobrée (1930-2008). British clarinetist Georgina Dobrée studied at the Royal Academy of Music with Reginald Kell and later in Paris under Gaston Hamelin. Dobrée performed around the world on both clarinet and basset clarinet. Many new works were written for her, including John Mayer’s Dance Suite. In addition to performing, she also completed extensive research, most notably on the Molter Concerti, which she later recorded. Additionally, she created her own recording label, Chantry Recordings. Naomi Drucker (b. 1932). Not to be overshadowed by her husband Stanley, Naomi Drucker’s career speaks for itself. At age 21, Drucker became principal clarinetist of the North Carolina Symphony. She graduated from Hofstra University, where she later taught for many decades. In 1994, she received the George M. Estabrook Distinguished Alumni Award for career achievement. Naomi Drucker is a creator of the American Chamber Ensemble, and she has performed around the world. Elsa Ludewig-Verdehr (b. 1936). The numbers speak for themselves: she has performed in every U.S. state and in 59 countries; she has given lectures in over 100 clarinet conferences; she has commissioned 225 works for the Verdehr Trio (clarinet, violin, piano); she has produced 30+ CDs and DVDs. As a Distinguished Professor at Michigan State University, she is respected for both her contributions to chamber music and her pedagogical legacy. Michele Zukovsky (b. 1943). Record-breaking Zukovsky began her 54-year career with the Los Angeles Philharmonic at the age of 21. She has performed around the world and in several world premieres, most notably John Williams’ Clarinet Concerto (1991). Zukovsky teaches at several renowned schools, including USC’s Thornton School of Music and the Pasadena Conservatory, which held its inaugural Michele Zukovsky Clarinet Competition in 2014. Sabine Meyer (b. 1959). German clarinetist Sabine Meyer is one of the world’s leading clarinet soloists, having soloed with over 300 orchestras. Meyer began playing with the Bavarian Radio Symphony Orchestra in her early 20s before becoming one of the first female members of the Berlin Philharmonic. Her appointment as principal clarinet in this historically all-male ensemble caused controversy, so she left to embark on her solo career. Despite the blatant sexism she faced, Meyer has become one of today’s most sought after soloists and teachers. Students from around the world compete for a coveted spot to study with her at the Musikhochschule Lübeck in Germany, where she teaches with her husband. Emma Johnson (b. 1966). Boundary-breaking British clarinetist Emma Johnson garnered international fame as the winner of the 1984 BBC Young Musician of the Year competition. She made her Carnegie Hall debut after winning the 1991 Young Concert Artists International Audition, and she has performed throughout Europe, Asia, Africa, Australia, and the United States. In 2016, Pembroke College, Cambridge revealed her portrait, making her the first female alumnus with this honor. Johnson was the first female to become and Honorary Fellow of the school. She also supports ClicSargent and the Ronald McDonald House Charities in the fight against cancer. Anat Cohen (b. 1979). Clarinetist, saxophonist, performer, composer, bandleader – Cohen does it all! Born in Israel, Cohen began clarinet at the age of 12 and fell in love with jazz right away. She later moved to study in Boston at the Berklee College of Music, where she fell in love with Latin American music. Cohen has been voted Clarinetist of the Year nine years in a row (!!!) by the Jazz Journalists Association, and she continues to attract fans worldwide. Shirley Brill (b. 1982). Winning an international music competition is the summit of many clarinetist’s wildest dreams. Brill’s won 3 – Markneukirchen International Competition in Germany (2006), Geneva International Music Competition in Switzerland (2007), and special prize winner at the ARD International Music Competition. Brill studied with Sabine Meyer in Germany and Richard Stoltzman in the United States. Her talent and musicality have attracted the praise of Daniel Barenboim, with whom she’s collaborated. Keep your eyes on Brill as she continues her awe-inspiring international career! By no means is this list comprehensive. History is being made every day by amazing female clarinetists. To all my fellow female clarinetists, continue the work of these fearless clarinetists. Defy the odds, play unapologetically, and most importantly…squeak like a girl! Leave a comment below with your favorite female clarinetists! Pamela Weston. “Out of Purdah: Three Early 19th-Century Female Virtuosi” from Heroes & Heroines of Clarinettistry. Manchusa Loungsangroong. First-Wave Women Clarinetists Retrospective: A Guide to Women Clarinetists Born Before 1930. Look up Lillian Poenisch in Chicago. she was an early mover and shaker here in Chicago orchestral circles! I’ll look her up, thanks for sharing! She was a teacher of my major teacher, a superb musician and Mensch. She also conducted the community orchestra at “The Gold Dome” park house. Unforgettable. Awesome! I’ll be sure to look her up! please don’t forget Annelien Van Wauwe, a Belgian clarinettist. She is a student of Sabine Meyer and Alexandro Carbonare (amongst others). She is mainly performing in Europe. She currently won another important prize. She is also a very gifted teacher! Dear Birgit, Thank you for sharing another incredible female clarinetist. There are so many amazing women that it looks like I’ll have to make a part 2 soon! Love Elsa! Was privileged to attend a master class she held while I was in college. She converted me to double lip embouchure, and even mailed me more articles on it when she got home. An awesome performer and a genuine and caring person! I love Elsa too! It sounds like she went above and beyond to help you make the switch to double lip. She truly is a wonderful musician and kind person! Moran Katz, from Israel, a Julliard grad currently working out of New York and teaching at Vassar and Julliard, is a terrific performer in a wide range of styles. Check out her colorful recorded performance of Roberto Sierra’s Sonata. I’ve heard her play – she’s wonderful! Pamela Spira first husband was Leonard Spira who founded the Victorian State Opera in 1962. I played second clarinet to Pamela on one occasion. She was also my teacher for a short period while I was studying economics at Melbourne University. You should look up Australian clarinettist Pamela Spira, nee Wechsler I think, around 1937. She was a student of Yona Ettlinger in Tel Aviv, who used the double embouchure, so her sound was exceptionally pure. Her first husband was Leonard Spira who founded the Victorian State Opera in 1962. I played second clarinet to Pamela on one occasion in the orchestra pit. She was also my teacher for a short period while I was studying economics at Melbourne University. I will look her up – thank you for sharing another wonderful female clarinetist to add to my list!